Newspaper people keep trying to jam the square peg of the traditional print product into the round hole of the Internet, but they’re no more successful than a two-year-old kid banging away at his junior workbench. When will they learn? The latest in a series of sure-to-be-ill-fated efforts is the boomlet in podcast-like, downloadable versions of newspapers supposedly optimized for laptop reading. Despite the failure of such projects in Europe, papers like the New York Times and the Seattle Post-Intelligencer are experimenting with the electronic delivery of high-hassle, low-satisfaction knockoffs of their print products. Say you're planning to take the ferry into work this morning, and you want to read on the trip. Fire up your computer, sign on to the Internet, then click on the P-I Reader icon on your desktop. This will launch the P-I Reader. You'll see the little arrow symbol in the upper right hand corner rotating – this means the P-I Reader is checking with our site to get the latest news. Once that arrow stops spinning, you'll have a sampling of the most recent news from the P-I in your reader. Now, you can close the program and be on your way. Later, you can reopen the P-I Reader offline and the news you downloaded will be there. Handy. Before you can use the P-I Reader, you have to register on the site and fuss for more than half an hour with downloading and installing a hefty software package that occupies as much space on a crowded hard drive as such really useful programs as Microsoft Word. When you fire up the P-I Reader, you get a decent-looking page (screen shot below) that approximates the look of a newspaper. But the static and linear presentation of headlines, words and pictures lacks the relevance, context and serendipity of the real thing. Of all the shortcomings, the thing I missed most is the opportunity of coming across an interesting story I wasn’t looking for. Although most of the day’s news probably is in there, the P-I Reader isn’t as easy to scan, prioritize and assimilate as content displayed on a large, thoughtfully designed printed page. For all the work involved in acquiring and manipulating the P-I Reader, you are left disoriented, anxious that you missed something really important and, well, generally dissatisfied. Perhaps it’s not surprising, then, that similar experiments in Europe have ended in disappointment for readers and publishers alike. In fairness, it must be noted that the Norwegian newspapers were selling their PDFs for the equivalent of $2 a day. Would free versions boost penetration to 0.7% of the market? If so, would it matter? In contrast to struggling fruitlessly to produce oddcasts of their print products, publishers need to upgrade their web sites with the information and customization tools that web users expect and will appreciate. 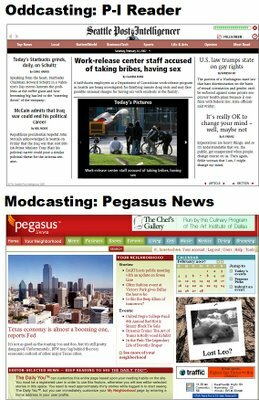 A good example of the newspaper website of the future hasn’t been produced by a major newspaper company but by an upstart Dallas start-up called Pegasus News. Pegasus News carves the sprawling Dallas-Ft. Worth market into 130 mini-zones and uses a nimble, all-media content-management system to feed news, sports, commentary and entertainment to users based on their preferences and geography. It even will send a text message to your cellphone to let you know when your favorite bar band books a new date. Pegasus News performs the traditional commercial function of a newspaper in a non-traditional way. Instead of being a one-to-many medium, Pegasus News creates dozens of virtual communities that make it possible for advertisers to target their messages to users based on their preferences and behaviors. And that, folks, is the future of the media business. When you take a peek at Pegasus News, which I strongly urge you to do, you'll also see it can be printed out for easy reading on the ferry. The output, of course, won't look like a newspaper. But it’s not supposed to. Publishers should run the controversial new E.T. promotional ads even if they don’t like them, says the chief marketing officer of the Newspaper Association of America. The targets of John’s campaign to reinforce the “Value of Newspapers” are advertising agencies deciding where to vector their media dollars. But the new campaign, whose first ad features a monocle-wearing, middle-age alien with a passing resemblance to E.T., sparked dismay among several publishers. They share my concern, expressed here, that the image fails to achieve the NAA’s stated objective of convincing advertisers that newspapers are a “contemporary, progressive and dynamic” medium. Mark was referring to mocked-up ad I included in my original post on the umpteen-million dollar blitz scheduled to launch in April. In response to requests from Mark and others, I am making the ad available to any newspaper agreeing to make a modest contribution to a charity benefiting children in its community. If you want a copy of the ad, click here for details. The NAA campaign alarms many of us because the caricature dominating the ad inadvertently reinforces the negatives that have caused a growing number of advertisers to steer away from newspapers. “While some of your comments might be accurate if the purpose of the initiative was to increase readership of newspapers by consumers, this campaign is aimed solely and exclusively at advertisers, their agencies and planners,” says John in an email reproduced below. The fatal flaw in John’s argument is that the success of the NAA campaign depends largely on newspapers running the E.T. ads for free. Last year, says John, more than 1,000 papers ran some or all of the ads in a similar program to promote the value of the medium. The donated ad space was valued at some $70 million by industry experts. Because the campaign will run in the ordinary columns of participating newspapers, the ads will be seen not only by the hip and happening kids who actually buy media but also by the hundreds of millions of regular readers who aren’t being “targeted” by the NAA and, therefore, aren’t in on the gag. Marketing consultants working for the newspaper industry – who are precisely the sort of savvy guys targeted by the NAA – have misgivings about the campaign, too. John says this year’s ads won high acclaim in testing among “dozens” of media buyers who compose the intended audience. But I say campaign flunks the test of common sense. Following is John's full response. It is reprinted in full with his permission. Thank you for recognizing the introduction (it doesn’t launch until April) of the newspaper campaign. For clarity, the campaign is not just the one ad or one creative treatment. There are five ads in the series – three that will be available for newspapers at the April launch and two others that will be available later in the year. While some of your comments might be accurate if the purpose of the initiative was to increase readership of newspapers by consumers, this campaign is aimed solely and exclusively at advertisers, their agencies and planners. Whether we agree or not, they think people are not coming to newspapers or their websites and that the industry is in some kind of audience free-fall. Nothing could be further from the truth as you “sort of” suggest. :: This is a B2B campaign and is very different from a consumer campaign. It’s the target customer we need to focus on; what their current perceptions are; and what message we need to deliver to improve and/or change that perception. The ad concept you offered is one for a consumer campaign and not one aimed at reappraisal of newspaper media by advertisers. :: So, assuming we have a sound strategic direction we also need true professionals to help execute. The Martin Agency is one of the leading creative and strategic ad agencies in the United States - (according to Advertising Age one of the Top 5) and has clients including GEICO, UPS, and now Wal-Mart with huge budgets and expertise as well. When you retain a firm for their expertise you should trust their judgment. We do. :: The Martin Agency wanted to test the impact of the proposed campaign which is why dozens of targeted agency execs have provided feedback. Almost all of the feedback has been outstanding yet we have tweaked based on their comments. :: Newspaper people are NOT the target. While we would like them to love the campaign, it is more important that the targets love it…. And apparently they do. 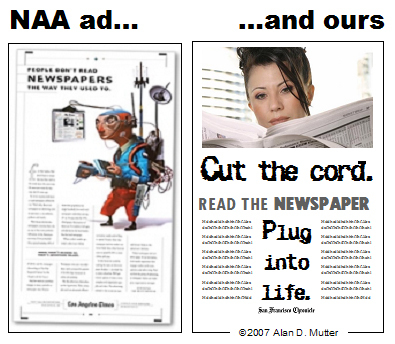 Our job at NAA is to build the compelling case for newspapers to run these ads like they did last year. :: The results from last year and its “goofy ads” resulted in over 1,000 newspapers running some or all of the ads on a regular basis. Over 136,000 advertisers have visited the website for more information about the industry and the value proposition. Hundreds of sales presentations have been made by NAA and our member newspapers. We must have connected with them in some way – goofy or not. :: Far from denigrating print as you suggested, the ads and their powerful copy speak to the strength, the local connection and the franchise’s ability to drive advertising results. The credibility of the print is what makes the digital product line so powerful. The graphics and the copy work together to make that point. 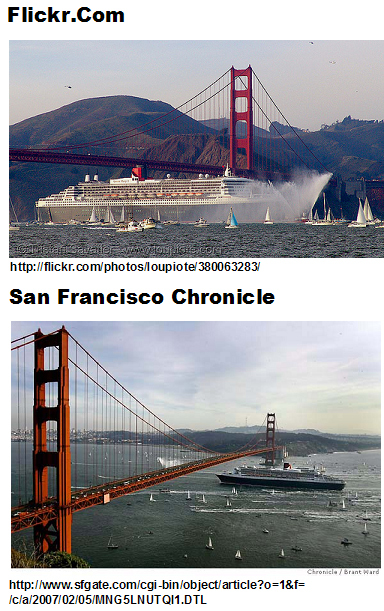 If we ignore that digital publishing is another way to reach newspaper non-users, we ignore reality. :: At the same time I don’t know of any newspapers that are giving up on the print franchise. As you said, it is the enterprise revenue engine that fuels innovation on all fronts. 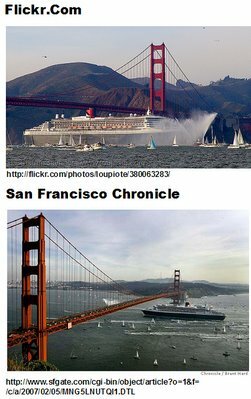 Just look at the pages of almost any newspaper and compare them to the same paper even five years ago. They hardly suggest an industry that has forgotten its roots. Having said all that, I realize that once you start talking about creative concepts you are open for comment on those concepts. The creative approach is unique that’s for sure and that’s just the point. It has stopping power (if you believe the target audience) and makes the case for reading the strong copy and the reappraisal proposition. Not everyone is going to fall in love with this campaign, but if it delivers the message of an industry that is energized and managing the migration and transition from a single format to one of multiple audience formats, I think it has done its job. No ad campaign is going to accomplish anything by itself, but it can help. It is then up to the individual newspapers to take that message and craft it into the value proposition for their organization. Then they have to go and sell that to their advertisers – print and online. If last year is any indication, we successfully trained over 22,000 newspaper advertising sales people in the use and customization of a standardized value presentation that started the process. Those sales people told us it made a difference and we’re looking to build on that success. One goofy ad at a time. Thanks again for your concern and passion for newspapers. If you want to promote the value of newspapers without using the E.T. ad, you can use my alternative for free. Get your PDF or PowerPoint version of the ad by sending me an email. All I ask in exchange is a tearsheet of the ad (preferably included in an intact copy of your newspaper) and that you make a donation to a charity benefitting children in your community. The recommended donation is $1 per 1,000 in daily circulation. If you use the ad, please note that you will have to substitute your own photo. Double-click the sample below to see a large enough copy of the image to read the copy. If you have trouble, drop me a note and I will send you the PDF for closer inspection. No salesman will call. This article has been moved here. Sorry for any inconvenience. The evident failure to find a buyer willing to pay more for the Tribune Co. than the present value of its depressed shares represents the last, best opportunity for publishers to save their businesses from stumbling to extinction. Newspaper executives have only a few short years to get this right. Otherwise, their once-enviable franchises will enter a prolonged liquidation phase characterized by collapsing readership, withering revenues, uncontrollable fixed operating costs and, eventually, unsustainable losses. Next to a windfall of unexpected cash, time is the greatest gift a troubled business can get, because it permits management to objectively assess its problems, assay its opportunities and enact an action plan to the fix the former and capitalize on the latter. Publishers of publicly held newspaper companies are getting extra time to fix their businesses, because the investors angry over the poor performance of the industry in the last few years know that they can’t pump up the value of their holdings by forcing the company to the auction block, as they did with Knight Ridder and attempted to do with Tribune. In addition to KRI and TRB, you may recall, the New York Times Co. and Dow Jones have been fending off disgruntled institutional investors calling for everything from major corporate restructuring to their outright sale. With metropolitan newspapers fetching approximately half the value they did only two years ago, the investment professionals who have been terrorizing newspaper managers know they now have only two choices: Sell their shares at a steep loss or sit tight and hope for the best. In all likelihood, they’ll do some of each. This gives publishers an opportunity to stop worrying about financial engineering and start concentrating on the strategic plans required to stabilize their publishing businesses while building vigorous new digital franchises. The substantial revenues and profits still flowing through most newspapers give them the ability to do this. But the respite won’t last long. The Newspaper Association of America is about to launch an umpteen-million dollar ad blitz that inadvertently reinforces all of the perceived weaknesses of the industry the campaign is supposed to combat. When you see the first of the ads scheduled to debut on April 2, your initial impression might be that you are witnessing an April Fool’s spoof gone bad. But you would be wrong. 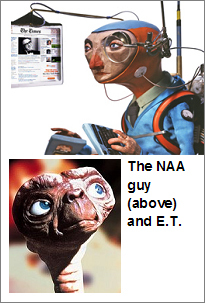 Unless something changes between now and then, the NAA will portray the newspaper reader as the E.T.-like doofus illustrated in the sample ad (below left) originally published by Advertising Age. The new campaign, which follows $75 million spent on other goofy ads last year, is aimed at making newspapers look “contemporary, progressive and dynamic” to potential advertisers, according to the creative chief of The Martin Agency, the shop producing the campaign. The NAA has not stated the amount it intends to spend on the new campaign, but it presumably will be equal in scale to the 2006 effort. Far from achieving the intended result, the caricature dominating the ad reinforces the negatives that have caused a growing number of advertisers to steer away from newspapers. Depicting the newspaper reader as a middle-aged alien (with a Col. Klink monocle, no less) hardly seems the way to convince media buyers that this remains a vibrant, mainstream medium. Harnessing the alien to an array of retro technology portrays him as anything but the sophisticated, plugged-in consumer that marketers covet. Sticking the newspaper on a pole in front of the alien’s face suggests anything but a contemporary, progressive and dynamic medium. The NAA and its agency got this ad wrong, because they have fallen into the trap of trying to defend against the perceived deficiencies of their product, instead of crafting a positive message about its strengths. We all know what’s wrong with newspapers. Print is static in an age of streaming video. The news arrives later in print than via broadcast, the Internet or mobile devices. Print puts editors, instead of the consumer, in charge of what’s covered. But those “negatives” are the very strengths that newspapers should be emphasizing to readers and advertisers. In a world of over-hyped, over-amped and over-saturated media, newspapers collect, select and organize the news of the world and your community, presenting the results in a simple, easy-to-use format that doesn’t require a power supply. As I have suggested in the sample ad below (at right), newspapers are the perfect way for people to cut the cord for 20 minutes a day and plug back into what’s important in their lives. That appeal transcends age, income, gender, geography and socioeconomic status – and should make equally good sense to readers and advertisers alike. With more than 90% of newspaper revenues still coming from print, newspapers must reinforce the value of their core product. Even as they develop the digital businesses that will help carry their franchises into the future, it would be a huge strategic error for publishers to denigrate print or dissociate themselves from it. Yet, that’s exactly what the E.T. ad is doing. 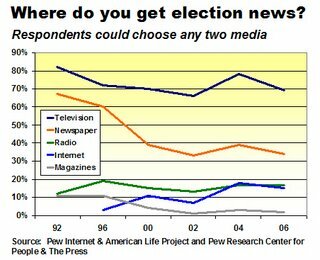 When it comes to election coverage, two-thirds of Americans don’t think of newspapers as a primary source for news. But you can bet your green eyeshade that this would come as stunning news to the platoons of journalists who believe every edition of every newspaper should include a heaping helping of politics. Eleven years ago, the newspaper people would have been right. But the media marketplace has changed so dramatically in the last decade that there appears to be a dangerous and growing disconnect between the instincts of journalists and the expectations of the people they hope to count as readers. Understanding and addressing the profound shift in consumer sentiment is a necessary first step in trying to save our newspapers, because no business can succeed by peddling products that don’t appeal to its intended customer. The abrupt rejection of newspapers as a primary political news vehicle coincides, not surprisingly, with the rapid rise of the Internet as an increasingly popular source of information. In 1996, 60% of respondents listed newspapers as one of their two primary sources of election news, according to polls from the non-profit Pew research organization. Since 2000, the number of individuals relying on newspapers for political news has declined. Only 34% of respondents last year cited newspapers as a primary news source. You can see how newspapers compare with other media in the chart below. 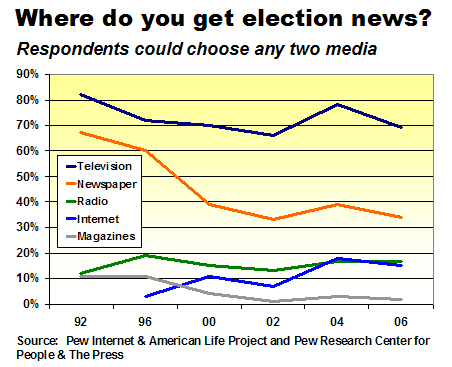 The Pew poll asks only where people get their election news, but it is fair to hypothesize that print (magazines have taken a tumble, too) is at a hopeless disadvantage to the electronic media when it comes to all manner of breaking and graphic news – from such prosaic matters as stock-market quotes to the chilling video of Saddam Hussein’s hanging. As market-driven businesses, newspapers urgently must reformulate their products to get in step with their customers. To date, however, the introspection has been shallow and the process has been superficial. After almost a decade of denial, newspapers finally have begun to recognize that they no longer are going to be the first to deliver the news widely available the previous day on CNN and Google News. But they haven’t developed a compelling alternative to the central mission that once defined them. Although the Associated Press and many newspapers have learned to top day-old stories with second-day angles, discerning readers won't be satisfied by old news in new ledes. They’re more likely to be insulted. For newspapers to succeed, they will have to bring fresh and valuable insight to running stories – explaining the background, analyzing the consequences, predicting future developments, profiling key players and so forth. They should do this not only with words, but pictures, charts, maps and graphics. As a puny but potential replacement for the long-gone, spot-news franchise, the concept of trivialized content got a boost when an experiment found that readers by a margin of 4 to 1 favored a prototype front page plugging Paris Hilton and legalized poker. Paris and poker bested the original paper, which had been led by news of President Bush in Europe and a feature about politicians who blog. The remix beat the original not because the news was dumbed down, but because the researchers worked harder to present the prototype package than the editors who put out the original. With an equal degree of thought, effort and time, the original stories should have been able to hold their own, if – repeat, if – they were worth doing at all. Although jumbo graphics have become the latest trend on many front pages (the Newseum gallery brims with good, bad and ugly examples), jazzy packaging won’t fool readers. Among those alarmed by the growing excess for the sake of excess is graphics guru Alan Jacobson, a persuasive advocate for intelligently executed front-page extravaganzas. Desperately seeking relevance, papers like the Rocky Mountain News are trying to counter-program the traditional approach to news. To celebrate its new compact format, the Denver tabloid in January kicked off a 33-part series reprising a 1961 tragedy in which 20 children were killed when a train slammed into a school bus. Launched with, natch, a page-one poster picture, the ambitious undertaking includes a hefty web package of videos, supplementary photos and even original archival material like the school bus sales brochure. While the Rocky deserves an “A” for effort, you would have to be snowbound for almost five weeks to have sufficient time to plow through each of the thirty-three installments. Are they trying to attract readers or punish them? 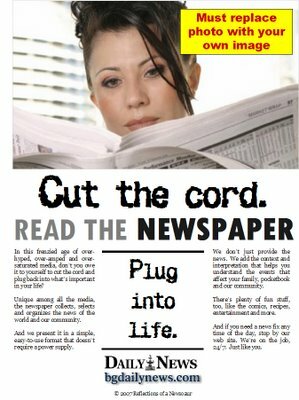 To be successful in the future, newspapers have to insinuate themselves into the lives of their readers by consistently delivering must-read, must-see, must-know information that makes them happy, sad, mad – and glad they're spending 20 magical minutes a day with the only thing left in the world that doesn’t require a power supply. The way to get there is with old-fashioned intellect, shoe leather and gumption. The best newspapers historically have delivered consistent value by providing their readers with exclusive, imaginative, passionate and compassionate stories – and the more local, the better. Journalists won’t succeed by writing for the Pulitzer board or each other. They need to reconnect with their readers. And they need to do it real soon.